It’s all about plaid and check today. It has been almost more than a year since plaid and checks took an uplift in fashion world and still going strong. 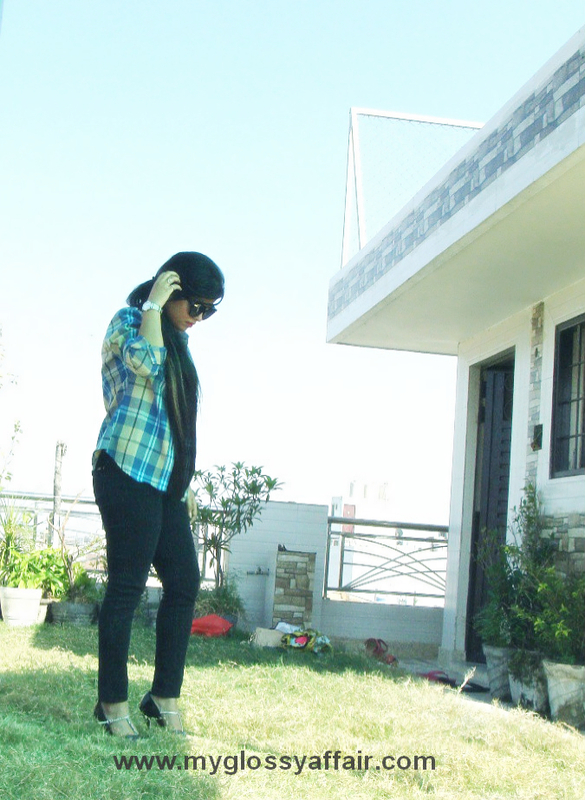 But whatever the fashion and trend is I have always loved plaids and checks, since I was a kid. I used to love mum’s plaid coats and dad’s check shirts a lot. So, when I grew up I inherited that plaid coat and I felt so so so happy for this. But then to fulfill my little childhood desires, I needed one check shirt too, but didn’t get it anywhere..as it was not in fashion. Be it office wear or just a casual day shirts always have a special place in wardrobe. I love shirts and specially checks and denims. I have bought 4 shirts in last two months..whoaaa I might sound crazy but no control baby. Due to that chickenpox episode in our home, many outfit posts became late. 1 full month of chickenpox and recovery and after that all those scars. Tons and tons of them. I still have lots of. But never mind, as they say, they would fade away in 6 months to a year or may be more :P. Can’t help much, so better is to forget and move on!! But lots of makeup can take care of everything :P. So enjoy the piccys now with Ritcha styling the plaid check shirt in different ways. 1.) In first look, I have styled this shirt in a formal way with black denim and stilettoes. It can be easily worn to any official meet or formal place. 2.) For the second look, I paired my plaid shirt with pink Palazzo. Actually it is a jumpsuit 😛 yessss…I am wearing my shirt over my pink jumpsuit and it makes it look like palazzo. I love this look, it was super comfy and perfect for any formal, casual or even a simple get together. 3.) For a casual chic look, I left it unbuttoned and paired with my favorite black denim and black spaghetti. 4.) In this look I have paired my plaid shirt with flared pink shorts, to give it a little twist and making it more comfortable to wear in summers. 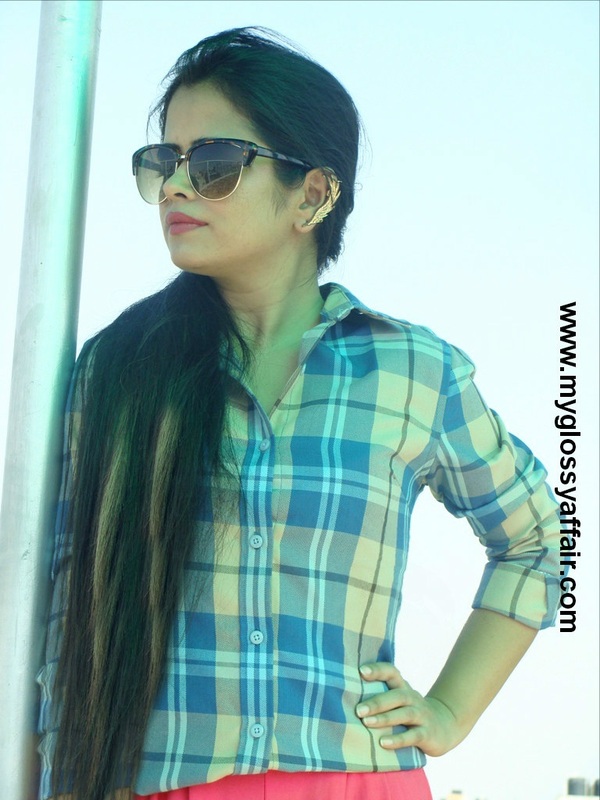 I hope many of you would be thinking of getting a checkered shirt now, only then I would consider this post of mine successful :). Get it beauties. I am sure you are gonna rock it. Do leave your comments and suggestions and feedback. I really love your love :). So just shower more and more. Coming soon with another OOTD. Here is my latest outfit: "Fall Vampy Look"
I love plaid your looks are on point. I like how the shirt looks with the reddish pink jumpsuit. These are awesome ways to style a plaid shirt! My favourite would be the first option, I love the black leggins and heels. The model is looking so pretty in all the dressing styles !! Ahhhh!! Loving the styles and you sure knew how to highlight the skirt. I like the pairing with the shorts. Beautiful styles, love this post.